Microflex XCEED Powder Free Nitrile Exam Grade Gloves utilize breakthrough polymer technology and manufacturing process to offer you a soft and comfortable nitrile glove that rivals the fit of latex while providing up to 60% more strength than the leading latex and nitrile brands. This glove raises the bar! We are confident you’ll agree, this is the best glove you’ve ever worn! 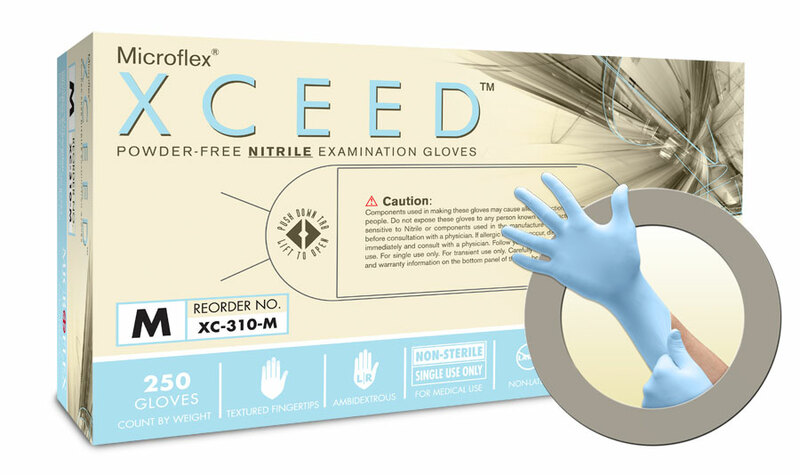 Xceed nitrile gloves are the first ergonomic certified exam glove in the industry. These high quality nitrile disposable gloves are much more durable than their peers and up to 90% stronger than the latex variety. Setting the standard with pinhole rates that are about 75% below the already stringent level set by the FDA, these gloves are quite popular in the dental, healthcare, laboratory, tattoo, industrial safety, manufacturing and automotive industries.